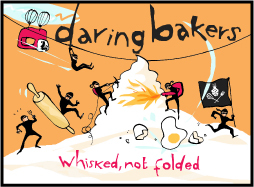 I still remember the day I stumbled upon the Daring Bakers. Do you? I thought it was odd. Why did everyone all of a sudden decide to blog about French bread? And why were they all using Julia Child’s recipe? I was sure I had found some sort of freaky food cult, but there was no way around it. Every blog, every comment, everyone was going on and on about these breads. It was like being the new kid in school all over again; only this time all the cool kids were talking about food & baking. This is my 6th month now as a Daring Baker and I got to cohost the August challenge with the amazing Meeta from What’s for Lunch Honey. She took me under her wing a few months ago and we immediately started scouring cookbooks for the ultimate recipe. 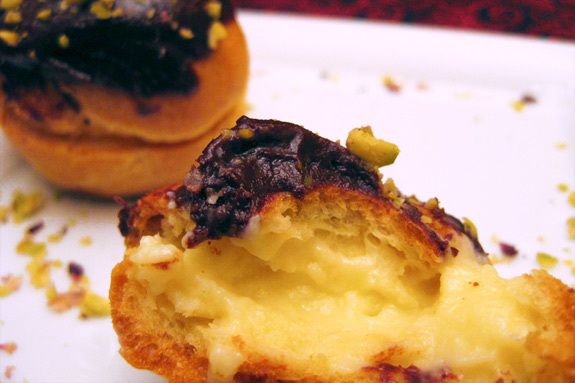 Choux dough is extremely easy to make, to my surprise. French pastries don’t exactly have the best reputations for being the ones you could whip up in no time. But for this dough there is no worrying about cold butter or overworking the gluten by stirring it for mere seconds. Nope, all this is left behind when entering choux paradise. Once these babies puff up in the oven, you’ve got yourself an empty canvas perfect for filling with whatever your foodie heart desires. I opted for an almond-infused pastry cream, and let me tell you: this pastry cream could be a dessert on its own. I had no problems eating it straight from a spoon as the profiteroles were baking away in the oven. Eventually, though, I had to exercise self control in risk of not having enough filling for the pastries. Next time, I’m doubling the the recipe for the cream – mark my words! I’ve got to hand it to the French – they know exactly what they’re doing when it comes to cuisine (especially pastries). I will definitely be making these again in the near future. I want to send a big thank you to all the Daring Bakers who joined us this month in baking eclairs! Finally, I also want to send a big hug to Natalie of Gluten A Go Go and Helen of Tartelette for helping us tackle any choux questions and offering their pearls of wisdom on how to achieve eclair bliss. 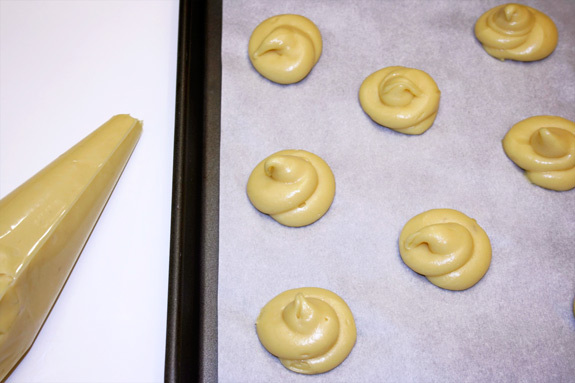 Pipe choux dough onto a parchment-lined baking sheet and bake at 375 degrees F for 25-30 minutes or until golden brown and dry. 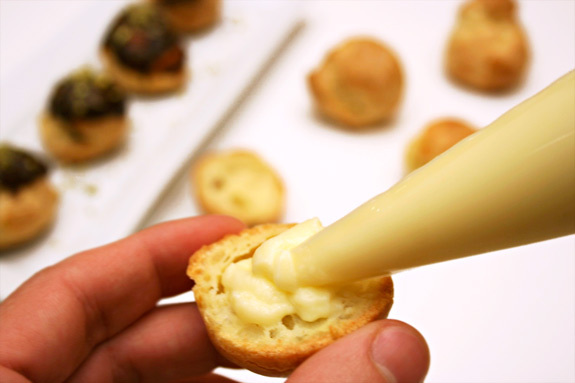 With a serrated knife gently slice open each profiterole and pipe pastry cream into the bottom half. Replace cover, drizzle with hazelnut chocolate glaze and top with finely chopped pistachios. Strain the mixture back into the saucepan to remove any egg that may have scrambled. Place the pan over medium heat and whisk vigorously until the mixture returns to a boil. Continue whisking for 1 to 2 more minutes (still over medium heat). Scrape the pastry cream into a small bowl and set in an ice bath to stop the cooking process. Make sure to continue stirring occasionally so that you end up with a smooth cream. Once the cream has slightly cooled, slowly begin to add the butter in three or four installments and then add the almond extract. Cover with plastic wrap and store in the fridge until ready to use. 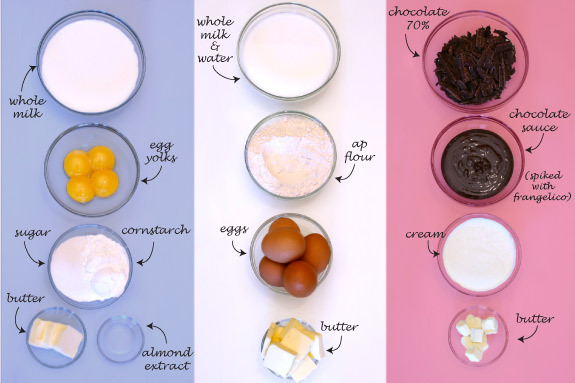 notes: The pastry cream can be made 2-3 days in advance and stored in the fridge. Stirring gently, add the butter, piece by piece followed by the chocolate sauce. It is best to glaze the éclairs after the glaze is made, but if you are pressed for time, you can make the glaze a couple days ahead of time, store it in the fridge and bring it up to proper temperature (95 to 104 degrees F) when ready to glaze. Place all the ingredients into a heavy-bottomed saucepan and bring to a boil, making sure to stir constantly. Then reduce the heat to low and continue stirring with a wooden spoon until the sauce thickens. It may take 10-15 minutes for the sauce to thicken. It is complete once you can run your finger through the back of the spoon and the chocolate stays separate. This sauce is also great for cakes and tarts. In a heavy-bottomed medium saucepan, bring the milk, water, butter, sugar and salt to a boil. Once the mixture is at a rolling boil, add all the flour in at once, reduce the heat to medium and start to stir the mixture vigorously with a wooden spoon. The dough will come together quickly. Continue stirring until the dough is smooth, dry and has come away from the pan (2-3 minutes). Transfer the dough into the bowl of a mixer fitted with a paddle attachment (you can also continue by hand). Let the dough cool while mixing on low for a couple of minutes so that the eggs do not scramble. Once the dough has slightly cooled, begin to add the eggs one at a time. The dough will separate in the beginning, but it should come back together after the 3rd or 4th egg. While the dough is still slightly warm, scoop it into a piping bag to beginning piping the éclairs or profiteroles. You can pipe the dough and freeze it. Simply pipe the dough onto parchment-lined baking sheets, and freeze. Once the dough is completely frozen, transfer the piped shapes into a freezer bag and store for up to 1 month. Posted in desserts, French, recipe by Antonio Tahhan on August 31st, 2008. You can follow any responses to this entry through the RSS 2.0 feed. You can leave a response, or trackback from your own site. Love the way your puffs look and the flavours you chose! Thanks Tony for a good challenge. I will be trying this recipe second time around. I liked the three nut variation to your profiteroles. Great looking pastry Tony, and I like the nut topping. Wonderful photos and a great combination of flavors, now I want to have one around for a special breakfast! INSPIRED IT IS ADDING ALL THOSE NUTS! AND YOU’RE SO ORGANIZED WITH YOUR INGREDIENTS… I COULD NEVER BE LIKE THAT… MOR LIKE A HURRICANE PASSING BY! Looks so delicious. Love the pictures. Would love to taste one. Beautiful, Tony. I’m sure you hear/read this all the time…but I really love your website, and the pictures are so educational & organized! Your site is like having a great professional baker/chef on tap 24 hours a day. Quiet confident and inspirational all at once. NO in fact it is like having loving grandparents who cherish to be with you and who are imparting their passion of cooking to their grandchildren. You must love food and teaching others about it and it shows. Beautiful pictures and so easy to understand. Thank you for the wondrous éclair choice for Daring Bakers Challenge this month. Enjoy making them. Yours look so professional. Also thankyou for giving Culinary Freedom is the bakers on this recipe. Thanks for choosing such a fun challenge- Although mine didn’t quite come out as I had hoped, it was still a good experience all the same. Yours of course look delicious! Mmm, they look gorgeous! I love it. Thanks for hosting a fun challenge. I have loved your photos with words and arrows for a while now. You make it look easy. Thank you so much for the August challenge and all the work that entailed. Tony, thank-you for choosing such a wonderful challenge this month! 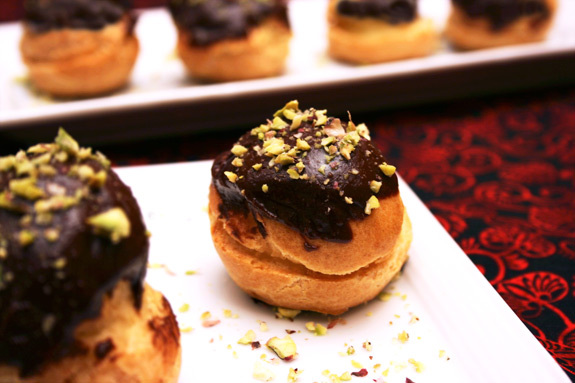 Your triple-nut profiteroles look absolutely divine! Thanks for the great challenge. Oh, and your blog is so beautiful! Great choice for a challenge! The biggest problem about these things is that you just cant stop eating them! These sound delicious! I almost used gianduja chocolate in mine because I love the combination of chocolate and hazelnuts. Maybe next time! Thanks for a fun challenge. They’re gorgeous and perfect, Tony! Thanks for the challenge, and it *was* a challenge, hehe. A tasty one, though. Thanks for all the wonderful comments!! I had lots of fun hosting this challenge with Meeta and we’re both very happy that everyone enjoyed it as much as we did! Wow, yes I remember discovering the daring bakers. At first it didn’t even occur to join, but once I did I couldn’t understand why i didn’t join earlier!! Beautiful eclairs and a wonderful challenge. Thanks heaps!! Thanks for co-hosting this months challenge! Your eclairs look amazing! hi tony ! i learned to do eclairs a year ago and since then have experimented with it in different ways one major experiment was using white chocolate as the glaze, saffron infused in the dough and a cool filling pistachios and a hint of rose water .. it was weird but none the less good 🙂 i love experimenting classic dishes with a twist ! Oh they look amazing, so well presented, so artistic, so beautiful. Thank you for picking such a great challenge. These are absolutely perfect, Tony! El año pasado logré hacer eclairs por primera vez… perfectos. Fué una gran satisfacción. Thankyou very much for your blog. Well done, Tony! Well done! Your pictures are gorgeous and I love that you made little puffs. Thank you so much to you and Meeta for handling this challenge so professionally. You’re a top notch Daring Baker! Gorgeous eclairs! Thanks for hosting!